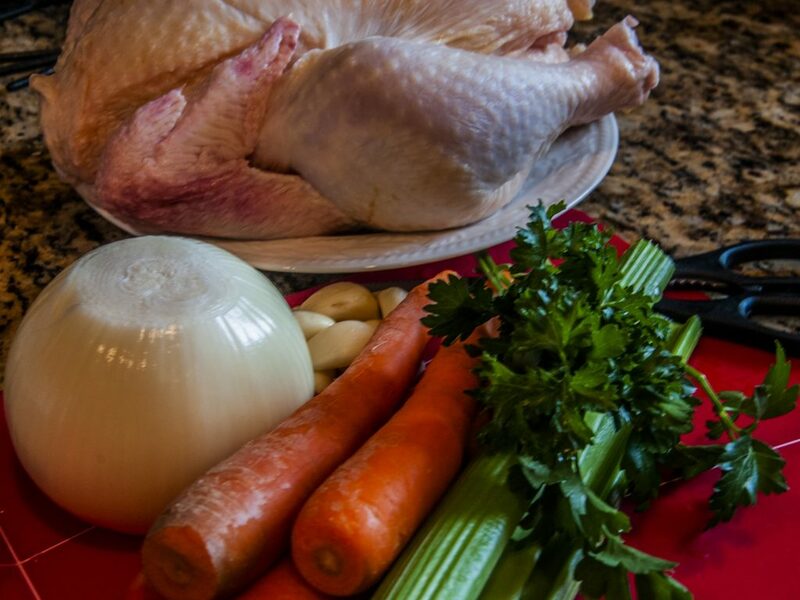 A good Jamaican chicken soup recipe focuses on making the best of available resources to create a tasty soup that appeals to taste and smell, has a pleasant texture and even a pleasing appearance. Sometimes referred to as Caribbean chicken soup, this chicken soup relies on spices and herbs to bring out the flavor of the chicken. Long, slow cooking helps tenderize the flesh of birds that might be long past their prime when it comes to tenderness, but that are packed with flavor. Nearly every location in the world has a food preparation that is similar in nature. The need to stretch resources and the desire to eat foods that are flavorful and nutritious are nearly universal. Many recipes list among other Jamaican soup ingredients a sort of mystery packet soup mix from Grace Foods, a Caribbean food manufacturer and distributor. The ingredients listed for the packet include dehydrated carrots, thickening agents, palm oil, guar gum, turmeric, parsley, paprika, and garlic, and well as “natural and artificial flavor.” For those who want that authentic flavor, the packets are available online should they not be part of your local supermarket’s line-up of spices. Another approach to the search for authentic flavor is to visit your local super market or ethnic stores and look for Jamaican spice mixes. There are several brands available. If you want to develop your own Jamaican seasoning, it is handy to have a starting point as reference for the flavor. Cajun spices are similar if you need to substitute, but they are not quite the same. You can develop your own line-up of spices and other goodies to add to your chicken to turn it into a tasty soup that could easily bear the name “Jamaican” even if it is developed in regions that are far from the cluster of islands that are just south of Florida, USA, and a bit east of Mexico. Such spices are likely to include items such as bay leaf, scallion, cassia, cinnamon, cloves, garlic, ginger, nutmeg, peppercorns, allspice, saffron, thyme, turmeric, vanilla and all sorts of peppers. The peppers can range from the mild-flavored bells right on up through the Carolina Reaper, which even beats out the ghost pepper. Of all these peppers, however, the most significant is the Scotch Bonnet, a deceptively innocent looking bell pepper that resembles a Tam O’Shanter hat in shape and that is warm enough that one is plenty for a large pot of soup. Jamaican soup ingredients often include items such as chayote squash, yucca root, and the famed Scotch Bonnet pepper. However, they also include more familiar ingredients such as carrots, pumpkin, onions, fresh or dried thyme, onions and garlic. Potatoes are also sometimes added to the mix or even turnips. Or you can take the approach suggested by one cook book author, and simply clean out all the vegetable bits from the crisper bin in your refrigerator. 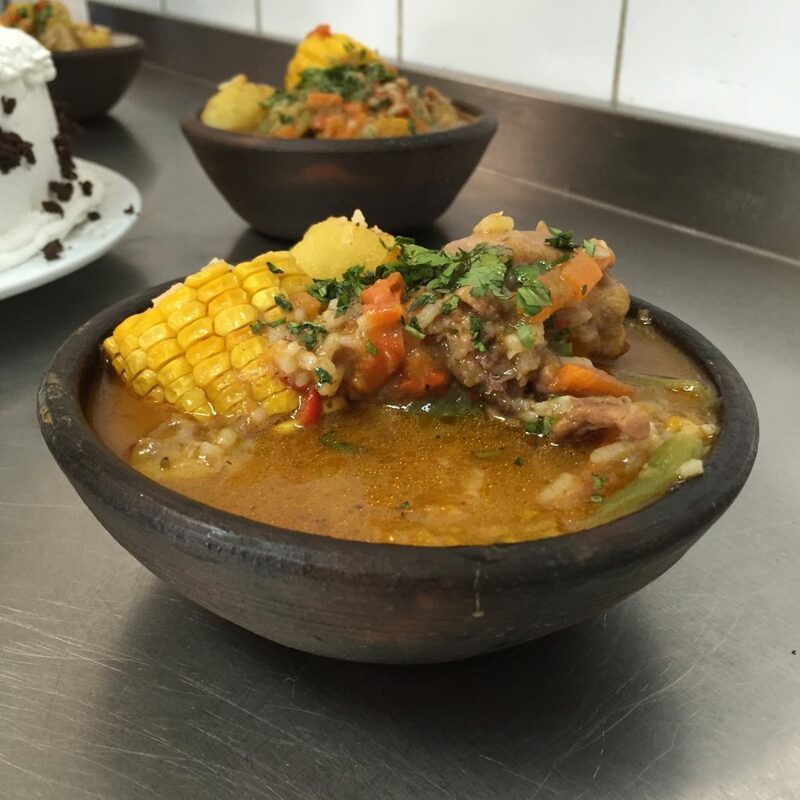 The key thing about Jamaican soup is that while it has heat, it also has flavor. Therefore, while one of the key ingredients is an oddly shaped and exceptionally potent pepper, you only want one Scotch Bonnet per pot of soup and care should be taken not to break it or it will cause the soup to be far too spicy to eat. The goal with adding peppers to the chicken soup is to add heat, but more than that it is to add flavor. For example, although the Scotch Bonnet adds a great deal of heat, it also adds a sweet pungency that is not lent by any other pepper or spice. Chicken soup has long been touted as a sovereign remedy for colds. While there is no scientific evidence that it can cure anything, it does do a wonderful job of relieving symptoms. Hydration is important when you have a cold or the flu. Chicken soup is a tasty way to introduce fluids to your system. While eating a hot bowl of chicken soup, you are breathing steam – often laden with the aroma of onions, garlic and perhaps even hot spices. This helps loosen mucus in the upper sinus cavities. Pungent spices and hot curry powder also help with thinning mucus. This makes it easier to expel the sinus obstructions and increases ease of breathing. Chicken contains cysteine, an amino acid that is similar to acetylcysteine, a drug that is often prescribed for bronchitis and other respiratory infections. And these are not the only benefits. The hot peppers, once primarily native to the Caribbean but now spread out all over the world, might help protect the system from the affects of foodborne pathogens of the sort that can often be found in warm climates. In addition to antioxidants, red bell peppers contain lutein that might help prevent macular degeneration. Jamaican style soup can have several variations. For example, it can be chicken and pumpkin soup, which is a delicious combination of chicken broth, pureed pumpkin, and spices. It often includes sage, which gives a new spin to the herb that is often associated with stuffing. 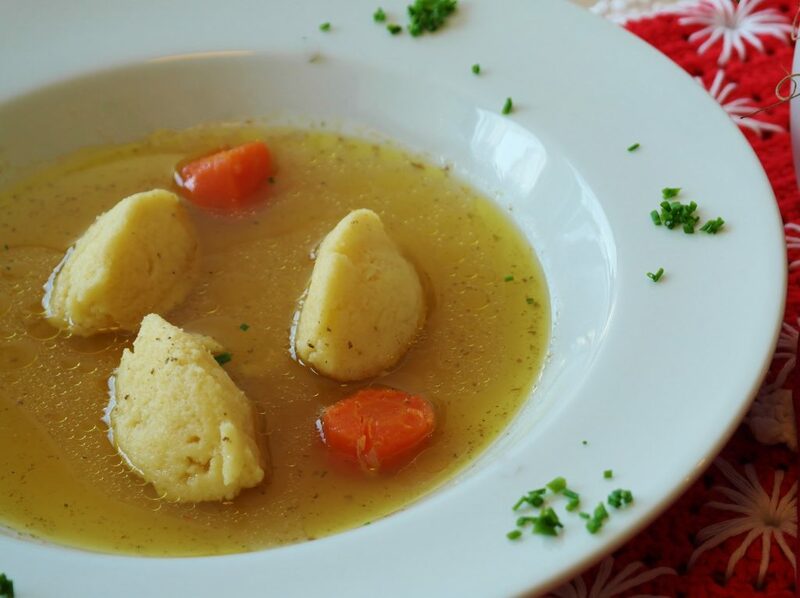 Another soup variation is Jamaican chicken soup with dumplings. These dumplings are nothing more than flour and water mixed together to make a stiff dough. 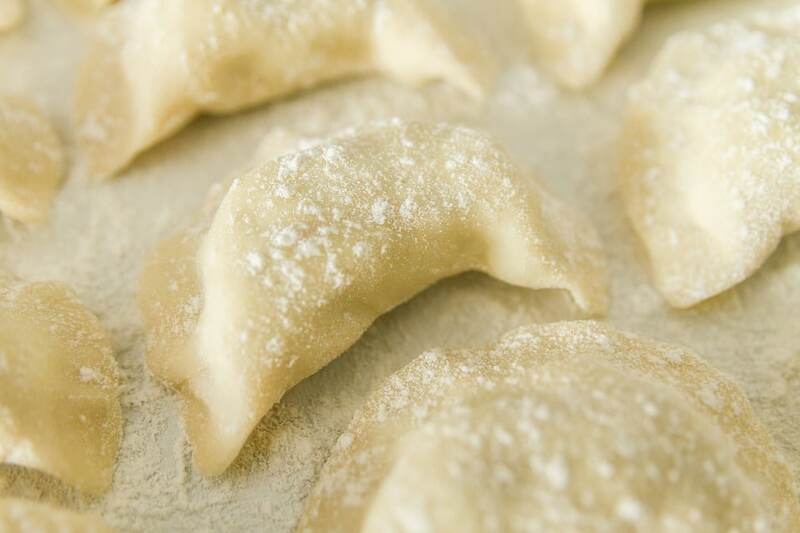 A somewhat modern variation is to add leavening to the dumpling mixture to make the dumplings a little lighter and fluffier. The lumps of dough are dropped into the simmering soup. The raw dough should descend to the bottom of the pot, and then rise to the top as it cooks. If several dumplings are desired, the cooked dumplings can be removed from the pot and more lumps of dough added to the liquid. The dumplings take on a little of the flavor of the soup. 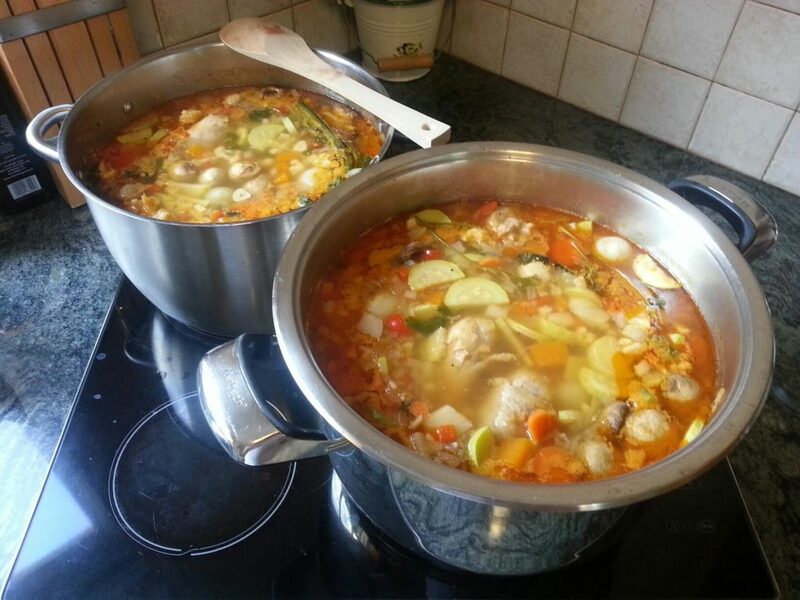 At the same time, a little of the dumplings mix into the soup, thickening the broth. Jamaican Chicken soup begins, logically enough, with a chicken. The best chickens for making soup are range fed chickens. Moving about, chasing bugs, scratching in the earth helps the chicken develop long, stringy muscles. While young range-raise birds are still reasonably tender, older birds tend to be tough, stringy and rather dry. That means that they are not especially good for frying or roasting. Immersed in a water bath, however, those birds can impart excellent flavor. Adding a little vinegar or pineapple juice provides natural enzymes that can help break down tough, stringy muscle tissue. Long simmering brings out the flavor of the bird, and might tenderize it a little bit. While it is busy simmering, cut open a kabocha squash. Scoop out the seeds and remove the skin. 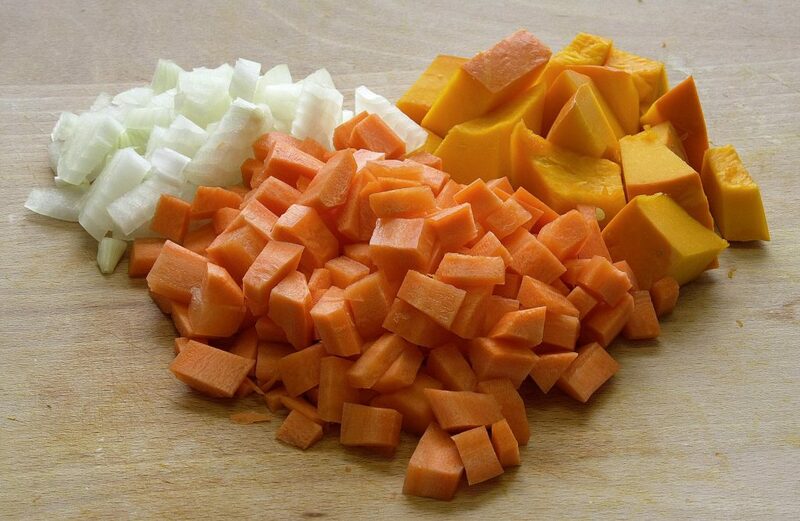 Cut the squash into cubes, and add it to the simmering chicken. Next, peel and chop a white or yellow onion and add it to the simmering mixture. While the pungent aroma of the onion begins to fill your kitchen, peel a potato. Cut it up and add it to the soup. If you are feeding several people, you can use the “one potato per person” rule to determine the number of potatoes that need to go into the soup. 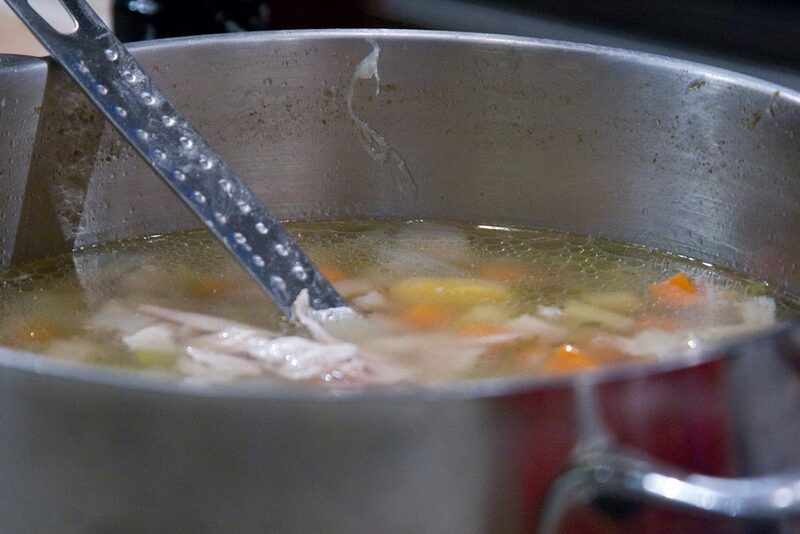 Boost the chicken flavor by adding chicken bouillon to the simmering soup. Throw in some springs of fresh thyme, four scrubbed, carrots that have been sliced into medallions, a few allspice berries, and finally, the Scotch Bonnet chili. 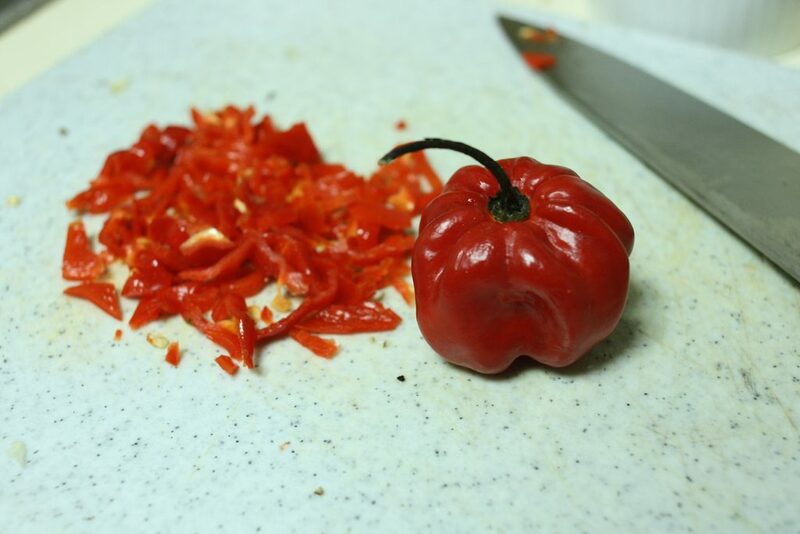 You will only need one of this potent little pepper, and it should be added last to prevent any chance of the potent pepper’s skin being pierced while stirring or adding other ingredients. 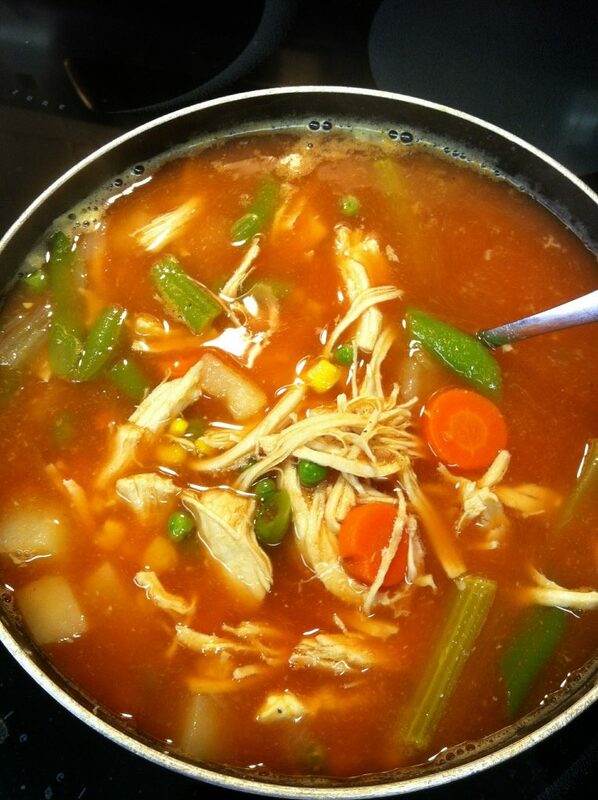 Allow the chicken, vegetables and flavorings to simmer together. From time to time you might need to add a little more chicken broth to the mixture. When the soup is well cooked, it is time to add the dumplings. Mix two cups of flour with 1 tablespoon of baking powder, as well as the salt and pepper. If you want a little extra flavor in the dumplings, mix a little powdered cilantro in with the flour before adding any liquid. Use about ½ cup of water or chicken broth to moisten the dry ingredients. You want to make a stiff dough that can be scooped up by the spoonful. Drop one teaspoon of dough at a time in the simmering broth. The raw dough will sink, but as it cooks it will rise back up to the top of the liquid. This will allow using a slotted spoon or scoop to fish the cooked dumplings back out of the broth. They can be served right away or kept warm in an earthenware bowl covered with a cloth. One of the lovely things about a soup of this nature is that it can be kept simmering throughout the day, which makes it an ideal dish for a busy family that cannot keep regular hours or that must work in shifts at complicated tasks that point toward a deadline. The other wonderful thing about Jamaican chicken soup is that it is one of those grassroots recipes that can have many variations on the basic theme. Kabocha squash is essentially a pumpkin. You can substitute pumpkin for it. You can use a milder chili pepper if you find the Scotch Bonnet to be too strong. You can even use a shallot instead of the white onion, and add a little turmeric as well as other favorite spices. The trick is to keep the chicken flavor in mind and to use spices that will complement it rather than cover it up. The vegetables can vary, as well. Add a sliced turnip for a little extra bite instead of relying completely on the potatoes to add body to the soup. Alternatively, you can leave the potatoes out completely and focus on the rich flavor of the squash to make up the body of the soup. This reflects the way people once made most soup – by using a little of this and a little of that, letting the materials on hand dictate the contents but exercising their knowledge of what would taste good together to meld the ingredients into a dish that was both tasty and nourishing. 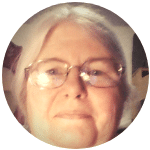 With that in mind, if you don’t happen to have a stringy rooster or a hen that has quit laying on hand, you can use some of the less expensive sorts of chicken cuts, such as legs and thighs or leg quarters to serve as the basis of soup. If you wish, you can bone the chicken before simmering it. However, if you choose to do that, it is a good idea to simmer the bones separately so that you can get the last shreds of meat off them and also so you can create a bone broth that can be added to the main dish. Bone broth is stuffed with nutrients derived from simmering them. Add your choice of spices from the list of Jamaican spices to create unique flavors. Stick to the basic principles of good flavor, long simmering, a nice bit of heat but more emphasis on flavor than warmth, and you will have a delicious Jamaican chicken soup recipe on which you can create many variations for infinite variety. Tantalising Variations To The Cracker Barrel Chicken And Rice Recipes: I Bet You Can’t Tell The Difference In Taste!